“I remember praying to die. At the grotto, I remember praying to die.” – Morgan Monte, 34, a peer support specialist for a community of mental health. In her late teenage years and during her sophomore and junior years at Notre Dame, Morgan Monte struggled with depression and suicidal thoughts, the same issues that she helps others combat today through her work. “It was in my mind all the time, like thoughts of being worthless. Everything I did, my mind would find a way to tell me that I screwed up somehow,” Monte said. Monte’s depression materialized in her high school years at Frankenmuth High School in the form of eating disorders. What started with eating too little and exercising too much reversed into eating too much. This then progressed to acts of self-harm and suicidal thoughts. Monte could not handle her emotions, she said, and sought to shut them down. The onset of Monte’s depression mirrors those of other teens — and her story is a common one. But in terms of teen suicide rates, Indiana ranks much higher in comparison to other states. According to the Centers for Disease Control and Prevention, suicide was the third leading cause of death among people aged 10-14 and the second leading cause of death among people aged 15-24 in 2015. This issue especially hit close to home in Indiana. According to the 2015 Indiana Youth Institute Kids Count Data Book, the state was third out of 37 ranked states for the percentage of teens who considered attempting suicide. Indiana was second out of 34 ranked states for teens who say they made a suicide plan. One in five thought about suicide. One in five made a suicide plan. One out of 10 attempted suicide. One out of 25 attempted suicide and needed medical attention. In South Bend, suicide prevention programming exists and is continuously developing. According to Zakowski, Memorial Hospital is partnering with South Bend Community Schools and will begin providing QPR training to teachers and licensed school staff throughout the 2017-2018 school year. Riley High School takes additional steps to address teen suicide. Suicide prevention programming is provided yearly in their health classes. They teach the signs of suicide as well as what to do if a friend or family member is suicidal. At the University of Notre Dame, steps are being taken to promote suicide prevention. 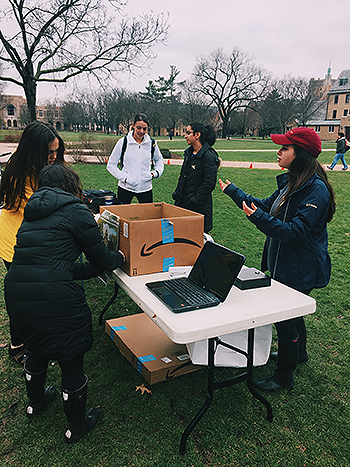 Howard Hall, a women’s dormitory, hosted an event called “Walk for More Tomorrows” on the South Quad of Notre Dame’s campus on March 30. The goal of the event was to raise awareness, support and prevention regarding teen suicide. Participants in the event were asked to donate $2 to the Suicide Prevention Center of South Bend and then walk around a track twice. As participants walked around the track, they read yard signs that included other statistics regarding suicide. The event prompted discussion on campus. The way teens talk about suicide has an impact. However, people cannot attest suicide to mental health and leave it at that, Mecca adds. “We say that it was the victim that didn’t know what they were doing, and were mentally ill…and then you just leave it at that…And it’s really sad to just leave it at that, because then it’s sort of a ‘my hands are clean of this, that’s sort of their problem’, they were born that way, done,” Mecca stated. For depressed teens, it may be cliché, but it is important to know that it gets better, said Monte. Monte has come a long way. Through medication, dialectical behavior therapy and a getting a dog, she is now helping others undergoing similar situations by sharing her story and co-facilitating support groups. She said that supporting others helps her see how far she has come over the years. If you or someone you know is struggling with suicidal ideation, contact the National Suicide Prevention Lifeline at 1-800-273-8255.